Our industry conceives of a floor plan and creates variations and elevations before considering material fit. As a result, multiple challenges are designed in. Framers over-build without adding structural strength; rooms don’t consider drywall or floor covering stock sizes and lead to scrap in one room and joining-seams in another. Foundation corners, anchor bolt placement, joist location, lam-beam usage, stair size, window size and location, floor plan details, mechanical chase locations, cabinet placement, roof plane intersections, and roof penetrations all create on-the-fly adjustments by trades. Compensating for plan shortcomings fuels waste in excess material purchases, delivery, labor, scrap removal, backhaul for partial credit, rework, warranty and admin. It is highly expensive, yet so common there is a phrase for it: “That’s just the way homebuilding is.” But that’s not the way it has to be. 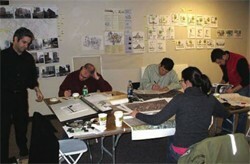 LeanDesign Charrette, an option with LeanPlan Workout and facilitated by award winning Architect (and former 200-unit production builder) Todd Hallett, considers construction methods and material fit during the design process so waste is designed out of a house, not designed in. 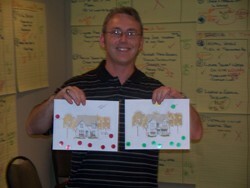 Plans and elevations created through the LeanDesign Charrette are appealing to homebuyers and more profitable to build. The Pre-Charrette Startup Package establishes design preferences and parameters around envelopes, style, square footages, price target, etc. The startup package gathers sufficient information to assemble preliminary design concepts for review and comment on the last day of LeanPlan Workout. Follow Up occurs about 21 days following LeanPlan Workout Week. The Architect returns to discuss three proposed floor plans, all meeting the builder’s needs as necessary for the market, and all ‘readily buildable’ based on the in-depth learnings from the builder’s suppliers and trades in the LeanPlan Workout. They meet your criteria, are highly marketable, and affordable to build. 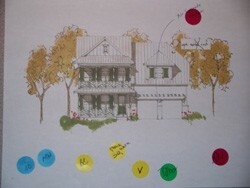 One-half day follow up to present the three designs with two elevations each.